Discovering a great new restaurant off the beaten path is a tricky thing. Why? Like a nurturing parent, you want the very best for the fledgling venue. You want it to be successful so it can stay in business and expand. In the same breath, you worry about success. If the “herd” discovers your new found secret garden of culinary delight then will it become the place where it’s impossible to get a table? Where the food suffers? Where the service isn’t as good as it was when you first went? Such is my dilemma with Canefield Tavern, an excellent new brunch venue at the corner of Nicholson and Lee. I suppose there are worse problems to have in the Baton Rouge market of best and brightest restaurants. Canefield Tavern is going to make it, with prompt and thorough service, with a solid set of wide ranged menus of well executed food, and ownership/management that seems genuinely interested and vested in your eating experience. Very easy to sit and converse with your individual table with no need to yell over other patrons or loud televisions. The menu had a large number of options for brunch. I liked that there was a wide selection between healthier fare like steel cut oatmeal to fried green tomatoes and eggs benedict. Larger parties shouldn’t have a difficult time finding something to suit everyone on the menu unless they are vegan. This place excels at homestyle comfort food with a sophisticated edge. Of course, it doesn’t hurt that there is a Bloody Mary Bar. 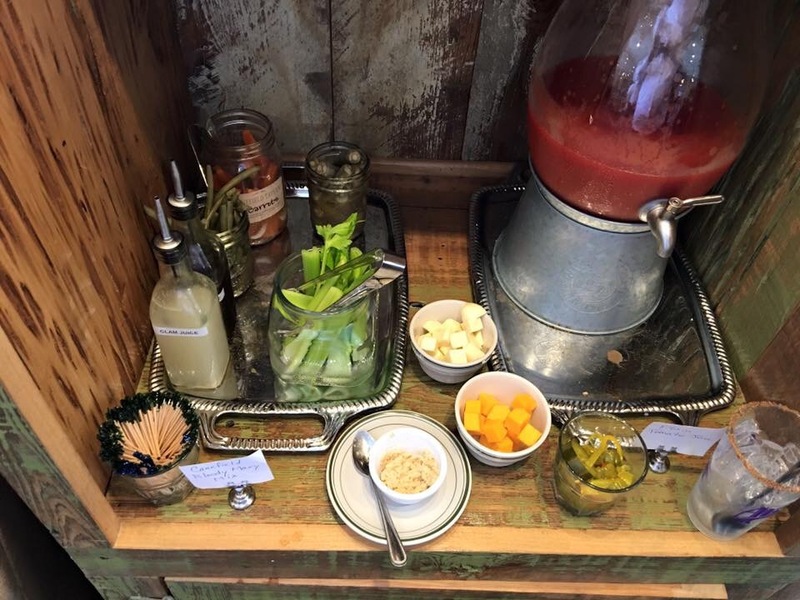 I will say it again, a Bloody Mary Bar. You order the base vodka and then you head to the bar area. 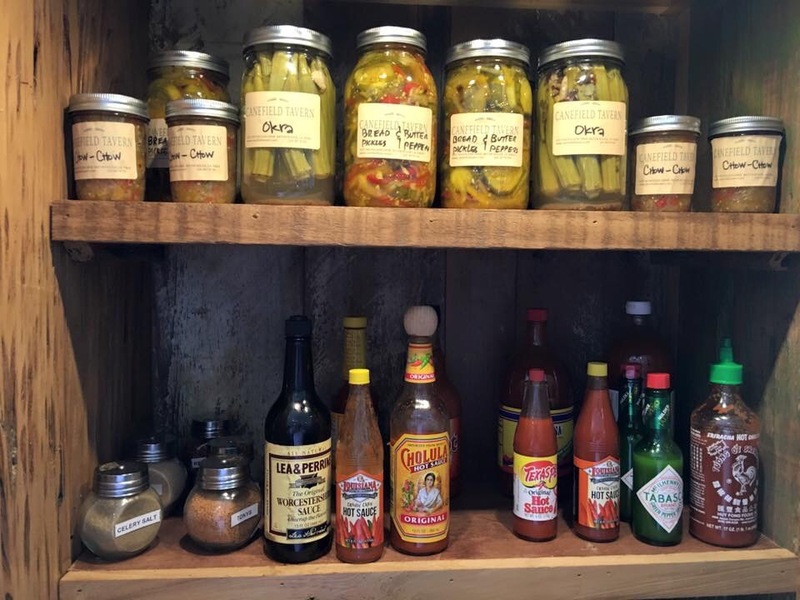 Spices, a garden of fresh pickled vegetables, hot sauces, different types of tomato juices and sauces, horseradish, cheeses, an option to add bacon, sausage, shrimp, oyster shooter or a boiled egg! You create your vision of perfection. 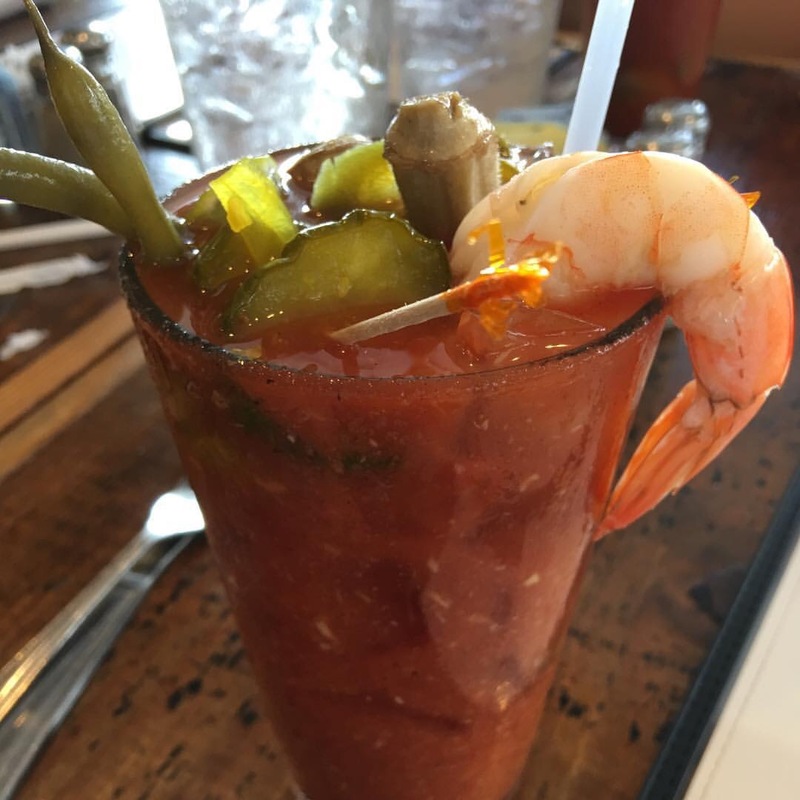 The Bloody Mary Bar is reason enough to try this excellent brunch spot, but wait, there’s more. The seating is open and there is plenty of room. The restaurant is not only child friendly but welcoming and accommodating. Canefield opens at 7am, alcohol is served starting at 11am. Another interesting thing about Canefield Tavern is that there is a breakfast menu AND a brunch menu. Did I mention a bloody mary bar? If Bloody Marys aren’t your thing, the Kir Royal was well executed and presented. Also consider getting the French 75. The Tavern puts cognac in their 75 instead of gin. It was a sweeter 75 than I am used to but nonetheless pleasing. I did preferred the Kir to the 75 though. 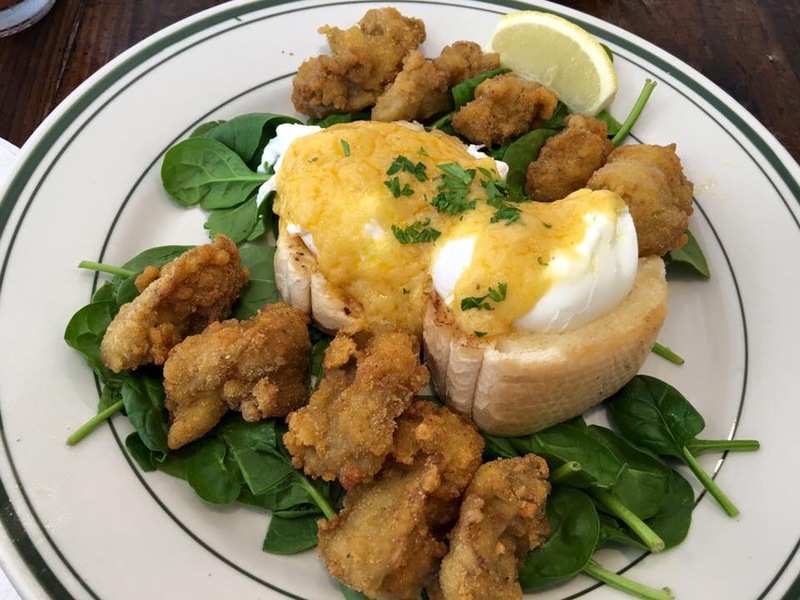 You must start with the Fried Oysters With Louisiana BBQ Butter. Deliciously battered in cornmeal and fried to a crisp perfection, the oysters are then tossed in a BBQ sauce that melts your taste buds. The oysters are served with french bread for dipping— I recommend asking for the sauce on the side. Why? The sauce gets some of the oysters at the bottom of the dish a little soggy. Not a deal breaker but MY ONLY ISSUE with the entire meal. This is a top shelf appetizer. 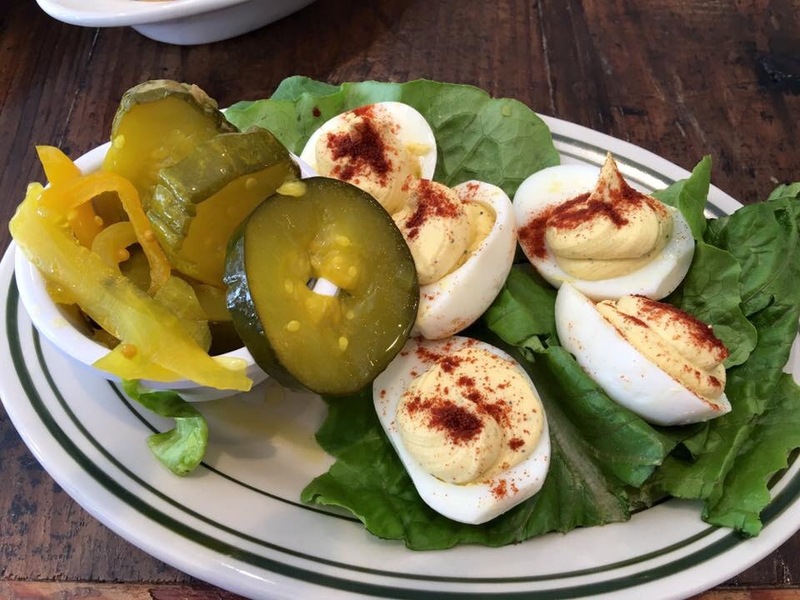 The deviled eggs are straight forward with a nice touch of homemade bread and butter pickles. The butter pickles were fantastic! This appetizer is a good effort at a classic “home” appetizer. 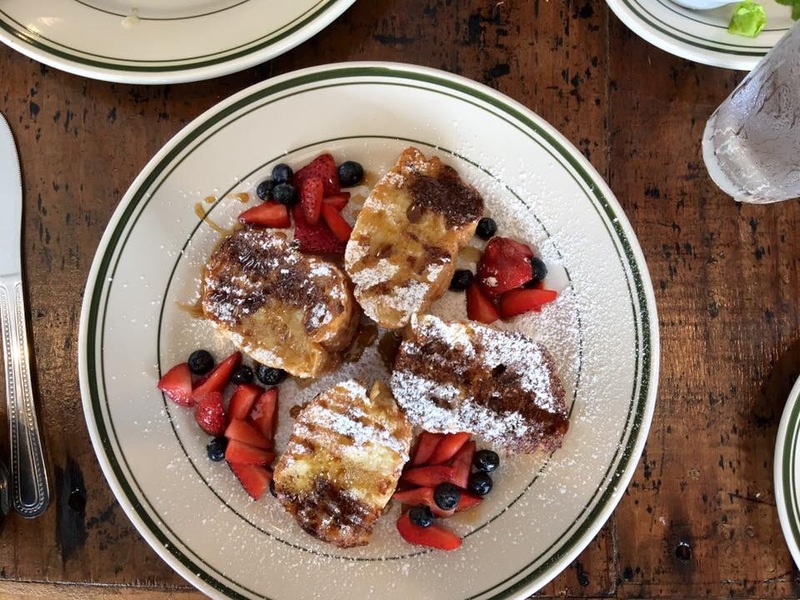 If you have learned nothing about Baton Rouge Brunches, we embrace comfort food. And what is the Baton Rouge Brunches emblem of comfort food? 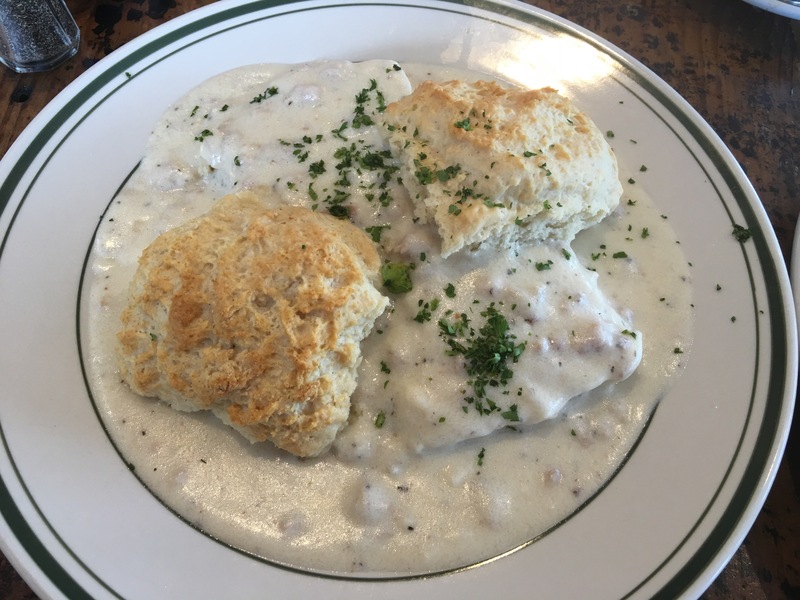 Biscuits and gravy. Canefield Tavern does not disappoint. There is a small order and large order of biscuits and gravy. The small is a huge delectable serving of biscuit-goodness. Freshly made and incredible! The biscuits were an outstanding start to the meal. 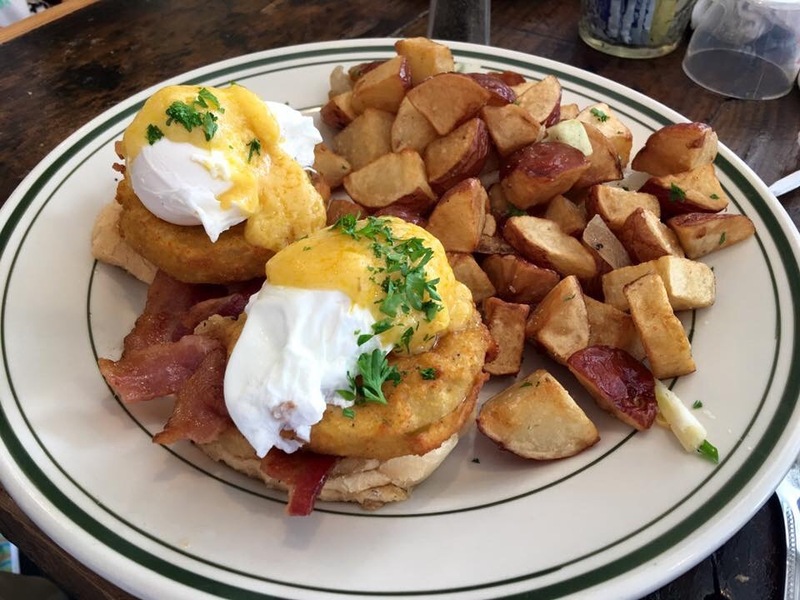 Fried Green Tomato Benedict: Perfectly poached eggs atop thick fried green tomatoes. Served with applewood smoked bacon with your choice of grits or griddled potatoes. We got the potatoes with the dish and they didn’t disappoint. Great serving size and fantastic approach to a kitchen classic. Eggs Louis Benedict: This was the table favorite of the brunch! The dish contains french bread with two perfectly perched poached eggs. This sits atop a sea of spinach surrounded by crispy cornmeal fried oysters. There is an appropriate amount of hollandaise sauce. There was a fantastic and welcomed portion of oysters. Served with choice of potatoes or creamy grits. We selected the grits with this dish. The grits are made with love—I mean love. They were obviously freshly made. They were obviously made to perfection. Pain perdu was very sweet and very good. Fresh homemade french toast is an art. Nice serving size and bread was fresh. French bread at Canefield Tavern is well executed and a continued theme throughout the menu. 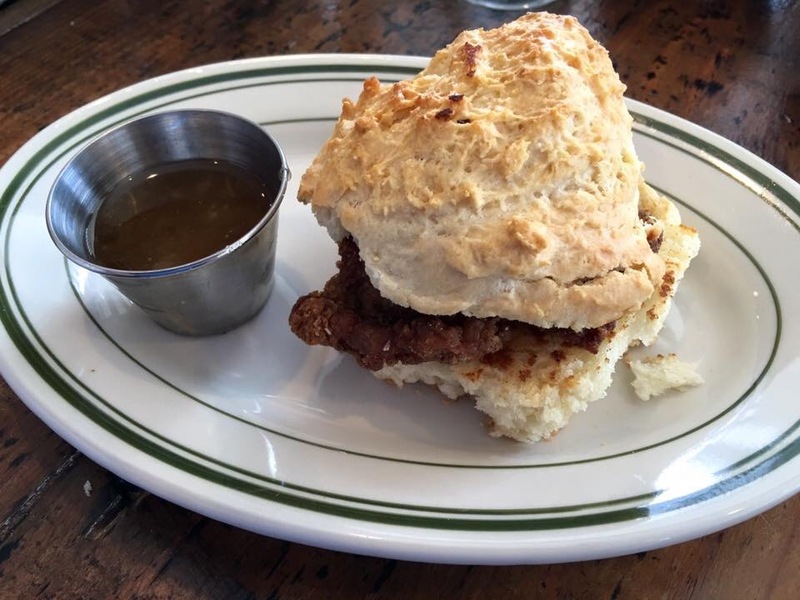 Fried chicken biscuit was good. More great comfort food. Canefield Kitchen also let us sample an off menu item that would be arriving next week, the “Baked Eggs”. These cast iron cooked eggs were cooked to perfection, herbes de provence was flavorful but well balanced with french bread as a nice complement. This dish will be a best seller. The thing you talk about when talk about Canefield Tavern.